Having grown up in Africa, I regard myself as extremely fortunate to have spent most of my life in close proximity to some of the world’s most spectacular large eagles. As a boy I remember watching spellbound as an adult Verreaux’s Eagle (then called Black Eagle ) snatched a Rock Hyrax twenty feet from me on the slopes of Table Mountain. I have witnessed the raw power of a Martial Eagle, one of the world’s heaviest eagles, take down a young Nyala antelope. And I have marveled at a pair of Crowned Eagles successfully catching Vervet Monkeys in the northeast corner of South Africa. But from as early as I can remember it is the Harpy Eagle that has been at the top of my “most wanted’ list. 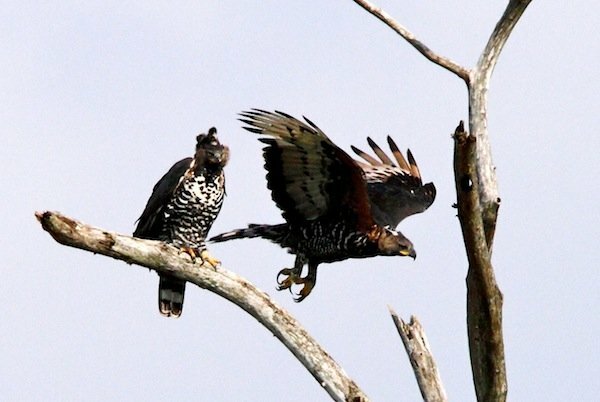 My dream of seeing this magical bird was fulfilled, albeit much too belatedly, during a 2008 BATV film trip to Guyana. Whilst researching this trip, I spent some time thinking about what makes the Harpy Eagle such a sought-after species. After all, there are many enigmatic species that birders long to see so what makes this particular bird so special? After picking the brains of some of the world’s top birders I realized that there is no one reason for this bird’s allure. In most cases the rarity of a particular species is the sole reason for its enigma. 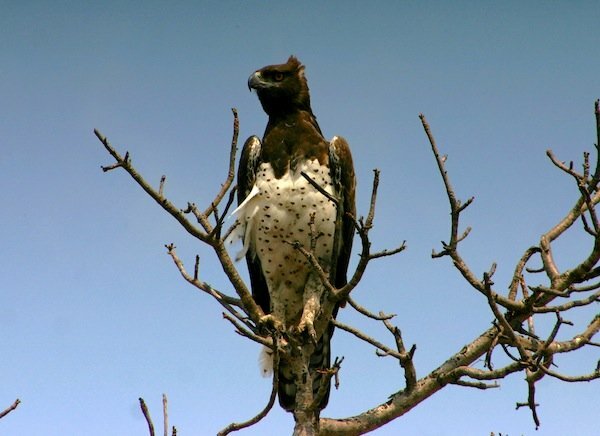 But the rarity of Harpy Eagles is only one of a handful of reasons why any warm-blooded birder drools at the mere mention of its name. The other name for the Harpy Eagle – “The Flying Wolf” – needs little explanation. On a recent trip to Belize, we caught up with Sharon Matola from the Belize Zoo and she introduced us to a wonderful male Harpy Eagle, an ambassador for his species. And so back to Guyana in 2008…It was with great anticipation as I headed out from the small village of Surama deep in the heart of Guyana with my crew and a few local guides to try and get a glimpse of this mythical creature. The best chances of seeing Harpy Eagles is undoubtably at known nest sites in countries like Brazil, Guyana or Suriname. But we were taking a bit of a chance with the Surama nest as the chick was already free-flying and about a year old. My worst fears were realized on the first day when we hiked over a mile into the forest only to find an empty nest and not a Harpy in sight. But we did find a lone feather, an indication of the presence of at least one bird. On our last day in the area we gave it a final go and headed off, drenched in sweat, and accompanied by the piercing calls of Screaming Pihas, a sound which I will forever associate with Harpy Eagles. And there it was – a juvenile Harpy Eagle sitting high up in a kapok tree. We had lucked out because the bird did not fly off. It was too pre-occupied with the remains of a kill that either it, or more likely one of its parents, had dispatched earlier in the day. This ranks right up there with some of my best birding moments and, although I’ve seen Harpy Eagles since, seeing this bird was truly unforgettable. The moment was captured for posterity in our Harpy Eagle show. How fortunate you are to have grown up near some of the most impressive birds in the world and to have seen Harpies- it is such a mega bird! The first good looks I had at them were a pair building a nest in Tambopata, Peru. They were so huge and their bills and talons so massive, that I recall feeling instinctively intimidated and a bit anxious. Although being referred to as “The Flying Wolf” reflects their power and cunning, I think “Avian Tiger” might be a more accurate monniker because they are a top predator that hunts solo and by stealth. Thanks for doing a show on this neotropical monster! Great bird. I need to get down to South America. Absolutely gorgeous raptors and a thrill to see anytime, anywhere! @Dale. I will always remember my life Crowned Eagle at Wilderness. We spotted what we thought was a very distant Forest Buzzard being harassed by a songbird and then – raising our binoculars – found out the “songbird” was indeed a Forest Buzzard. Classic Jochen. I always remember hearing Crowned Eagles in the sandforests of KwaZulu and then finding out that they were actually Red-capped Robin-chats (Natal Robins) mimicking them from the understory. Frustrating little buggers! @ Jochen, great story. Crowneds are awesome and Forest Buzzards are never a dry ID challenge! @ James, how did I know someone was going to say that. Natal Robins – the masters of the fake Crowned Eagle call.